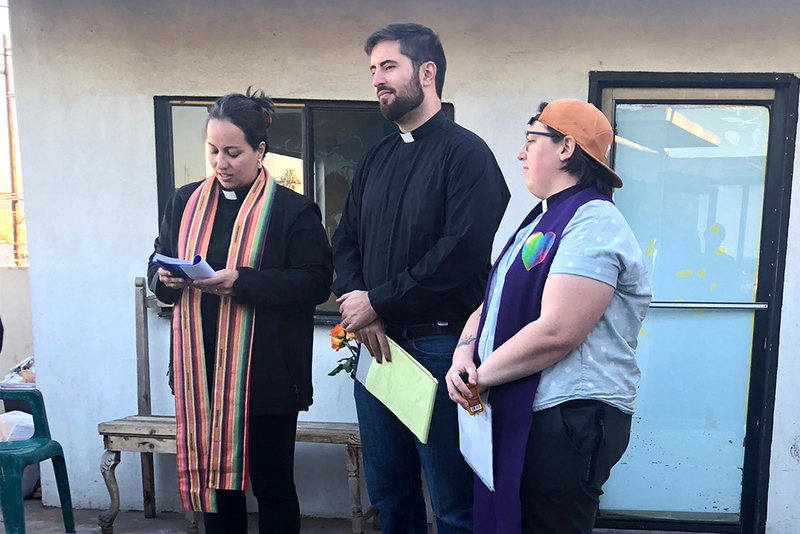 Two Eastern Mennonite University alumni traveled in early December to Tijuana, Mexico, to assist people seeking asylum in the United States. As part of a Charlottesville-based group of lawyers, law students, clergy and a clinical psychologist, Alicia Horst ‘01, MDiv ‘06 and Brittany Caine-Conley MDiv ‘14 joined efforts to provide legal and other support for people among the thousands awaiting opportunity to present themselves at the U.S.-Mexico border. The Charlottesville group collaborated with a bi-national nonprofit that provides legal services to refugees in Tijuana. Horst, the executive director for NewBridges Immigrant Resource Center in Harrisonburg and accredited by the U.S. Department of Justice to practice immigration law, provided legal guidance to asylum seekers. She also served as a witness at some of the 10 weddings conducted by a three-member team of clergy including Caine-Conley, who is a United Church of Christ pastor and leader of Congregate Charlottesville. In addition, the team of clergy accompanied a group of boys ages 15-17 to the Otay Mesa port of entry where they attempted to present themselves for asylum but instead met militarized U.S. patrols. Mexican immigration police then took away the boys, she said. The group also observed a queue system improvised by asylum seekers: a worn notebook maintained by a committee and containing a list of names. Each day the U.S. Customs and Border Protection indicated how many people – 60 to 100 – could be called from that list for credible fear interviews, which determine eligibility for entering the asylum process. If the asylum hopefuls were not physically present in the plaza to hear their names being called, they would miss their chance. With 5,000 people already on the list when Horst and Caine-Conley arrived, the wait is months long. Members of the migrant caravan that had recently arrived in Tijuana were “not even close” to being called, Horst said. “It’s a very messed-up scenario,” she said, as many of the people have fled from dangerous situations and through danger to arrive at the border only to be met with further injustice. Lacking means to meet their immediate or longer-term needs, many feel desperate – the context, Horst said, for events such as the highly publicized Nov. 26 attempt to reach a border fence in which children were among those repelled with U.S. tear gas. Tear gas was again used against migrants on New Year’s Day. Watch news coverage with NBC-29 or CBS-19. Read more at C-Ville Weekly.